8 Delicious Ways to Use Chia – Political & Current Affairs Blog Published by Celeste Greig. It wasn’t long ago when chia seeds were most well known for being spread onto animal-shaped terra-cotta pottery and growing into green “ch-ch-ch-chia” pets, with the lush greenery filling in for fur. However, those tiny chia seeds are useful for far more than making novelty items; they’re incredibly beneficial for your health. Today they’re gaining popularity as a functional food item that supplies an impressive variety of nutrients in just a small dose, such as two tablespoons. Although they’re mostly grown in Mexico and Bolivia, in 2014 the first US company growing chia seeds was established. Originally, the seeds were being targeted as equine feed, but their benefits to four-legged animals extend to humans as well. ALA is considered essential because your body can’t make it, so you need it in your diet—or its long-chain animal-based derivatives (like the omega-3 found in seafood and krill oil). While chia seeds have been found to increase levels of both ALA and another omega-3 fat EPA, they don’t increase the omega-3 fat DHA. While your body can convert ALA into DHA/EPA, it does so at a very low ratio, and only when sufficient enzymes (that many people are deficient in) are present. It’s thought that the combination of fiber and protein in chia seeds, along with the gel-like texture it takes on when combined with liquid, contributes to feelings of fullness and satiety. Fibrinogen, a natural clotting agent that when lowered improves blood flow, was also decreased, as was an inflammatory marker called hs-CRP, which went down by 40 percent. What else is healthy about chia seeds? Chia seeds contain about 10 grams of fiber in just two tablespoons. Mounting research suggests a high-fiber diet can help reduce your risk of premature death from any cause, likely because it helps to reduce your risk of a number of chronic diseases. This includes type 2 diabetes, heart disease, stroke, and cancer. Most people need upwards of 32 grams of fiber a day, but most Americans get nowhere near this amount. One of chia seeds’ greatest qualities is how easy they are to use. They have a mild flavor that makes them adaptable to a variety of recipes, and they’re gluten-free, which is perfect for those with celiac disease, gluten intolerance, or who are simply trying to avoid gluten. When chia seeds are soaked in water overnight, they take on a tapioca-like texture. Add some cinnamon or other spices and a bit of stevia, if you like, for sweetness and you’ll have a pudding-like treat that can be eaten morning, no one or night. Measure out chia seeds, coconut milk, extracts, and honey. Mix well and refrigerate for at least 30 minutes or even overnight so the chia seeds absorb the moisture and become thick and gelatinous, like a pudding. 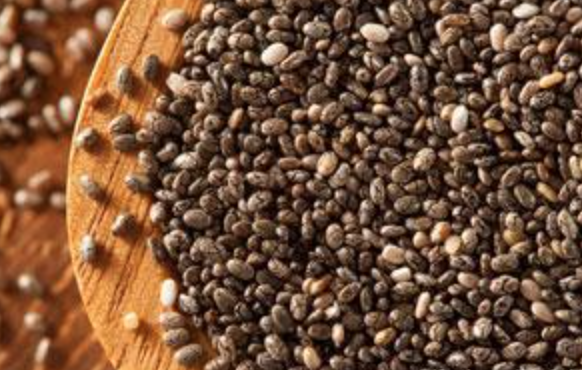 Chia seeds can be added to virtually any dish, from raw yogurt to applesauce to smoothies. Keep in mind that they will take on a gelatinous texture after they mix with a liquid, so if you prefer a crunch, sprinkle them on just before eating. While I suggest you use chia seeds in homemade items, there are ready-made pouches that contain chia seeds as a primary ingredient. Watch out for the sugar content of these, but if you’re in a pinch they can make a decent snack on-the-go, even for kids. You can blend chia seeds with berries and stevia to make your own homemade jam. You won’t need pectin because chia seeds gel-up just fine on their own. If you’re looking for a healthy, gluten-free breading for fish, meat, or vegetables, chia seeds make an excellent addition. Try them blended with finely ground nuts and your choice of spices for a delicious breadcrumb replacement. Mix the ingredients together and store in a clean jar. To use, dampen face and apply scrub in a circular motion to damp face. Allow the mixture to set for two minutes before using a wet washcloth to remove. Splash cold water on your face when you’ve finished. Chia seeds are known for enhancing strength and vigor, so try adding them to your post-workout whey protein shake. Sprouts may offer some of the highest levels of nutrition available, including vitamins, minerals, antioxidants, and enzymes that help protect against free radical damage. Many of the benefits of sprouts relate to the fact that, in their initial phase of growth, the plants contain more concentrated amounts of nutrients. Chia seeds are no exception, and you can easily grow chia sprouts at home to use raw in salads and sandwiches. “First we analyzed the white chia. Then we analyzed the dark seed. Although the nutrition analysis was almost identical we discovered that the darker chia had an additional important antioxidant, quercetin. It is well known that darker foods have more antioxidants than lighter ones. This proved to be so in the ORAC analysis. The dark seed tested at 80 micromoles TE/g and the white seed test at 70 micromoles TE/g. Our analysis showed that omega-3 chia contained one of the highest levels of omega 3s found in any food. So while chia seeds are a quick and easy-to-use superfood that can add valuable nutrition to your diet, do use caution when consuming them, particularly if you have esophageal restrictions or are giving them to children.